Prior to the 1960s, women spent far more energy (and money!) than men on trying to look prettier and younger. Then, the advent of a more equalized relationship between males and females, women started demanding that the men in their lives shape up (literally and figuratively), encouraging them to eat healthier, exercise regularly and look their very best. While there are certainly differences between men’s and women’s skin, the fact remains – men need to take care of their skin every bit as much as women do. Whiskers have larger hair follicles than the soft, downy hair found on women’s skin so these pores need to be cleaned regularly to prevent build-up and breakouts. Mustaches, beards and other grown-out facial hair traps dirt, sweat and environmental dirt/debris that needs to be gently cleaned away morning and night. Certain times of year (winter and summer, particularly), jobs and climate variations can leave men’s skin dry so moisturizing is equally important for men as it is for women. 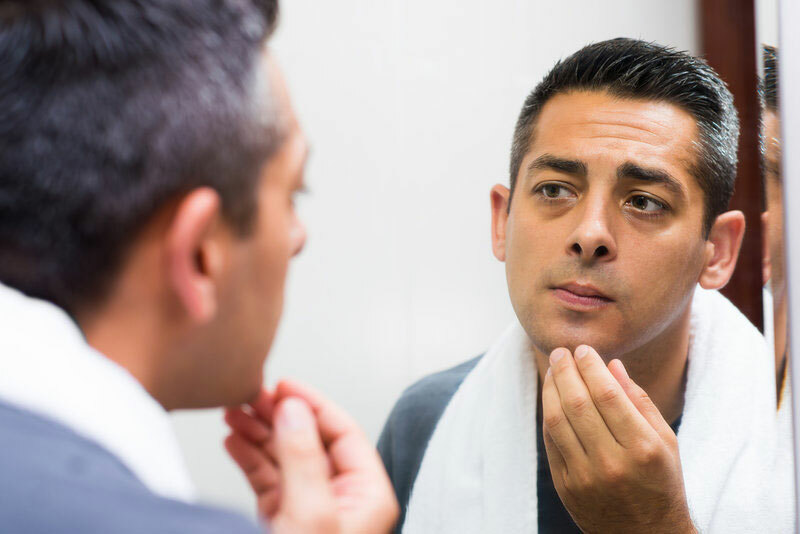 As a result, we’ve come up with these five simple, but effective ways to encourage men to establish regular skincare habits that includes regular visits to a professional esthetician. Yes, even men should establish a daily skincare routine; the start and the finish of the day should include gentle cleansing. Again, a visit to a day spa – including a facial – means the gentleman’s skin is professionally analyzed so they can select the right skin care products for his skin type and needs. During initial and ensuing visits, we’ll discuss the environmental threats he’s exposed to both at work and at home. For example, men who work outdoors or enjoy outdoor recreation/hobbies on a regular basis need to have the right type of UV protection from the sun. Exposure to chemicals, grease, cooking oils, etc., will affect the types of skincare products we recommend for cleansing and moisturizing – and we may recommend serums designed to create extra protection from environmental threats. Anti-aging starts at home – with the foods you eat and getting regular exercise. Diets high in anti-oxidants are proven to help prevent cancer and keep skin looking younger and healthier. You can take that a step further and adhere to an anti-inflammatory diet, particularly helpful for those prone to acne and other health conditions connected to an overactive inflammatory response. However, the same anti-aging products designed for women benefit men – they’re just formulated differently. Anti-aging skincare products and serums for men are designed and mixed to address men’s skincare needs and have more neutral or masculine scents. Men are prone to acne just as women are. Sometimes, male acne is even worse – particularly in adolescent/teens and older men because acne is associated with higher male hormone levels. We’ll personalize skincare routines to treat acne – as well as to remove acne scars for a smoother, more unified complexion. Since men can’t wear makeup with the same abandon that women can, we’ll also introduce them to medical-grade silicone, which can be used to camouflage more severe acne breakouts without attracting dirt and bacteria like makeup does. These silicone masks stay put – even while playing sports – and can be used for the six- or so weeks it takes to get acne under control. We can also help men address concerns about uneven pigment, milia bumps and other blemishes that are causing them discomfort or making them self-conscious about their looks. Because male facial hair is thicker and more coarse than women’s, which translates to larger pores, they are more prone to razor burn and razor bumps (called folliculitis). This is especially true for African-American men because curlier hair is more apt to get trapped under the skin (ingrown hairs). These bumps should never be squeezed like pimples as that will make things worse. Instead, we’ll treat the skin and/or shaving issues at hand and then recommend specific products that prevent future episodes. Ready to introduce the man in your life to essential habits and products for healthier, younger-looking skin? Book him an appointment at Skin Deep. Our spa is clean and modern in its design – making it as comfortable for male clients as it is for our female clients. A skin consultation and professional facial will get your man back on track using simple but essential skincare products and treatments designed for men.